A Rights to Information (RTI) query filed in 2012 and answered after July 2013 has revealed that Prime Minister Manmohan Singh's basic salary was Rs 50,000/per month, with a sumptuary allowance of Rs. 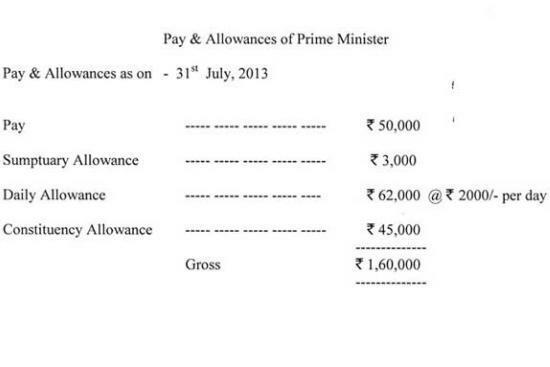 3,000/pm a daily allowance (@Rs 2000 per day) of Rs 62,000, and a constituency allowance of Rs. 45,000. But, clearly, that is not all that the prime minister enjoys, for the post comes with the residence at the coveted 7, Race Course Road in New Delhi, personal staff, special armoured limousines, SPG security, a special jet and much else besides.